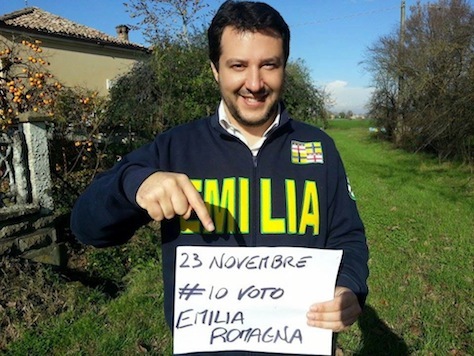 That the Northern League is breaking out of northern Italy and into central Italy, with plans to attract national support, is due to the vision of its young new leader, Matteo Salvini (pictured above). When longtime Northern League head Umberto Bossi stepped down in April 2012, due to corruption allegations, it left a void that might never have been filled. Historically, the Lega and its various regional components have advocated for greater regional autonomy or even independence for northern Italy, which it calls ‘Padania.’ Despite calls, from time to time, of an independent Venice, the autonomist movement in northern Italy pales in comparison to, say, the Catalan or the Scottish separatist efforts. Bossi’s exit elevated Roberto Maroni as its leader in 2012 and 2013. But Maroni, a longtime Berlusconi ally who had previously served as a labor and interior minister in national government, eschewed the national leadership for an opportunity to become the president of Lombardy, the country’s most populous region and the home of the Italian financial and fashion capital, Milan. In the December 2013 leadership contest that followed, Salvini easily defeated Bossi’s attempt at a comeback. Salvini’s populist rhetoric and hard-line stands are gaining traction for his party, according to polls. The December 5 IDX survey shows that the Northern League has 10.1% support, the highest level in years, even as Berlusconi’s Forza Italia wins just 14.5% and the Nuovo Centrodesta (New Center-Right), led by interior minister Angelino Alfano and a sect of former Berlusconi allies who are propping up Renzi’s government in the Senato (Senate), the upper house of the Italian parliament, wins just 2.4%. Renzi’s Democrats win 38.4%, and the centrosinistra (center-left) holds a wide lead of 43.5% to 32.0% against the broad centrosdestra, with the anti-austerity, anti-eurozone Movimento 5 Stelle (M5S, the Five Star Movement) of blogger and comic Beppe Grillo still attracting 18.9%. While Salvini is the flavor of the month, Italy finds itself in the odd situation of having a united center-left and a disunited center-right. Berlusconi, who has presence, wealth and media control, can’t be ruled out as a force on the right. 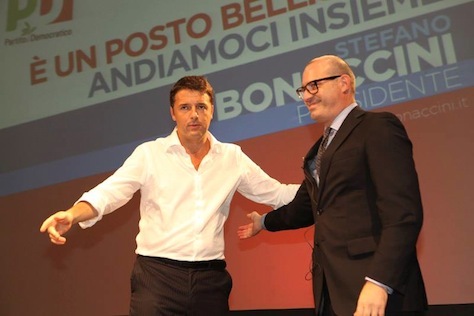 That leaves Salvini, Grillo, Alfano and a league of potential pretenders, including Christian democratic leader, Pier Ferdinando Casini, fighting to emerge as the ‘next’ Berlusconi, even before Berlusconi himself has left the stage. And if there’s a lesson from the February 2013 elections, it’s that you should never underestimate Berlusconi, notwithstanding his more recent and deepening legal troubles that led to his expulsion from the Italian Senate in December 2013. Generally speaking, Renzi’s push to reform Italy’s political and economic institutions is not moving forward as rapidly as planned, though Renzi is likely to achieve reforms limiting the power of the Senate and revising Italian election law, which has earned Berlusconi’s endorsement. Since the regional elections, Renzi also won a key vote of confidence on labor market reforms in Italy. Last week’s vote gives Renzi the power to revise labor laws without returning to the Italian parliament for approval. With staggering levels of youth unemployment, a low-growth economy for the past 15 years and potentially in a triple-dip recession, Renzi hopes to make it easier for large companies to fire workers, while extending unemployment benefits (despite Italy’s burdensome public debt). Though it’s won the prime minister little support among the labor unions that have always been cool to his push for reform, and Renzi’s approval ratings are gradually slowing, he’s still by far the most popular politician in the country and there’s little doubt that, if he called a snap election tomorrow, he would win. That’s not outside the realm of possibility, considering that Italy’s 89-year-old president Giorgio Napolitano, elected to an unprecedented second term in April 2013, is contemplating retirement. Renzi, whose majority in the Camera dei Deputati (Chamber of Deputies) is secure until early 2018, may nevertheless use Napolitano’s resignation as an opportunity to call fresh elections — the first time that Renzi would face voters as the leader of the Democratic Party and as prime minister. Previous PostGermany’s Left Party comes of age with Ramelow victoryNext PostOne solution to Moldova’s problems? Just join Romania.